When you walk into the minimalist show at the Museum of Contemporary Art and you find yourself looking at tiles on the floor, a pile of bricks, a huge piece of paper tacked to the wall with a black rectangle on it, a piece of iron with a tube leaning against it, a broken cabinet painted white, and so forth and you wonder what these things are trying to say to you. 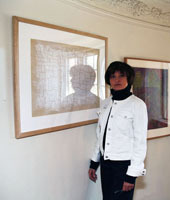 That’s what minimalist art is saying: What are you looking at? When you are looking at Carl Andre’s thirty-six Zink and Lead tiles on the floor and you are asking yourself “what am I looking at,” your answer is “I’m looking at thirty six metal tiles.” Period. 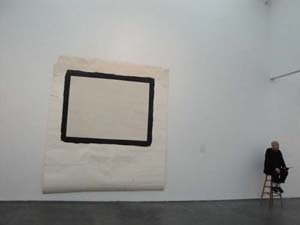 When you are looking at Tony Conrad’s rectangle on that huge piece of paper and you can’t see anything inside the rectangle, you can step back and enjoy the rectangle. Period. 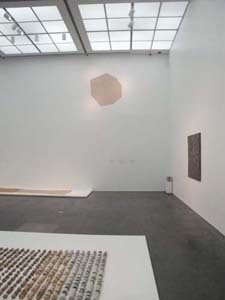 Richard Tuttle constructed an octagon in 1967 and stretched some purple cotton over it, calling the work “Purple Octagon.” The color has faded in these past three decades, but there it is, hung high on the gallery wall. What is it? It’s some wood with some cloth stretched over it. There’s a piece in this show of such great value that it’s entirely encased in Plexiglas, the way the Mona Lisa is encased in bulletproof glass at the Louvre. This piece, by Pinky Palermo, is a long thin vertical rectangle with two colors, both ordinary cloth bought cheaply at a store sometime in the 1960’s. I didn’t get a photo of this major work. I remember the colors as hot pink and some drab green, with a seam about three-quarters of the way down, the pink being on top. What makes this work and others like it “major” is its sheer minimalism, i.e. 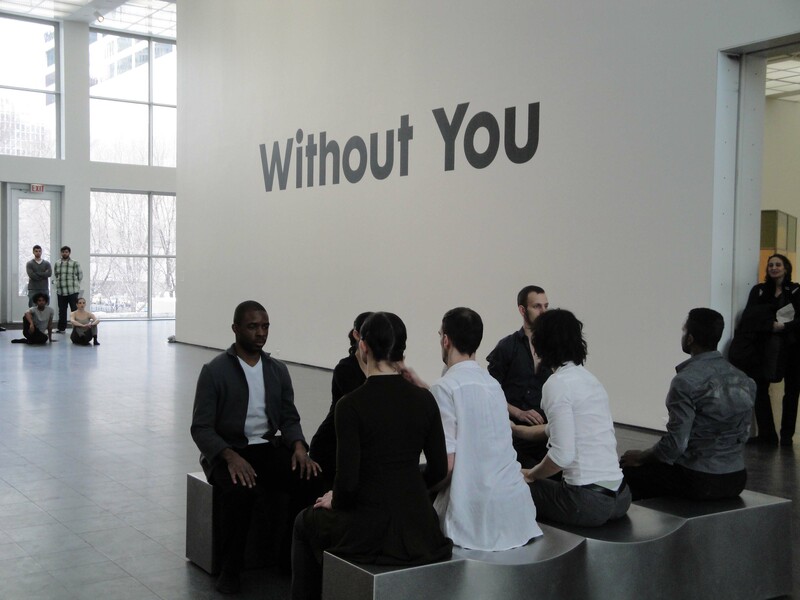 it’s extreme way of confronting you with “waddayoulookinat .” Minimalist art says, “if you’ve came here to find symbolism, heartfelt expression, passion, meaning—and of course you have, because this is ART—then you can just fuhgeddaboudit. Forget about meaning in art. If you want meaning, go find it in your real life, in reality, in the physicality of the objects that surround you. What you see is what you see, no more. 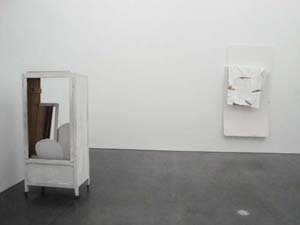 The minimalist blip happened in the art world in the early 1960’s. What did we have before then? We had Abstract Expressionism. Ah! The artist was a hero, elbow-deep into his existential pain, anguish, angst and despair and dashing paint on his huge canvas. The act of creating was agonistic, a struggle always, and we the viewers of the works empathized with the gestural drips and slashes and felt in the presence of meaning in the making. Well, how long can we have art like that? A couple of decades, thank you. After that, we need to have our retinas and our minds scrubbed so that we don’t become complacent. That’s the modern sensibility. We love the shock of the new. Wakes us up, reminds us that it’s all made up. There’s no “progress” in art, there’s just a new angle every now and then. Is this tongue-in-cheek? Is this funny? Of course, it’s funny. It full of irony, the way a mind, to be considered adult, has to operate on a current of irony. 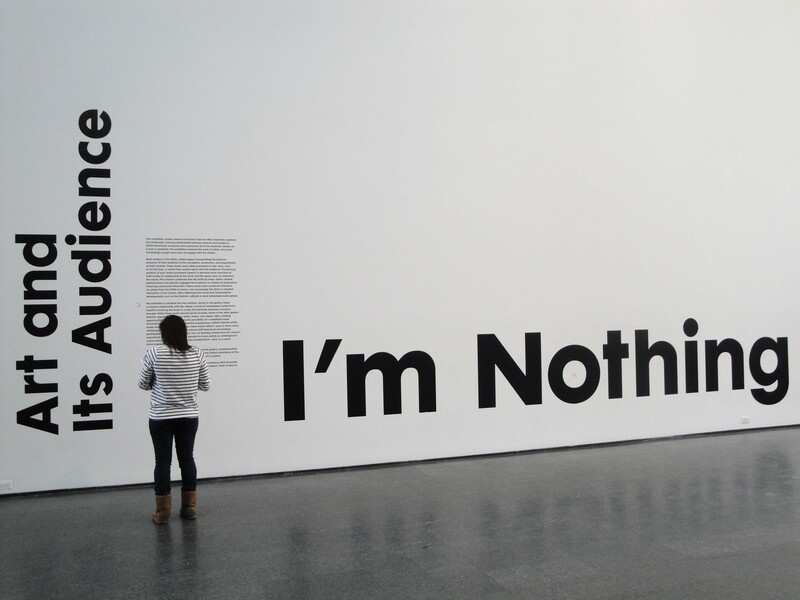 Minimalism trashes meaning and the quest for meaning. Ordinary objects, made without any special skill, are now enshrined in museums and are worth millions of dollars. Why? 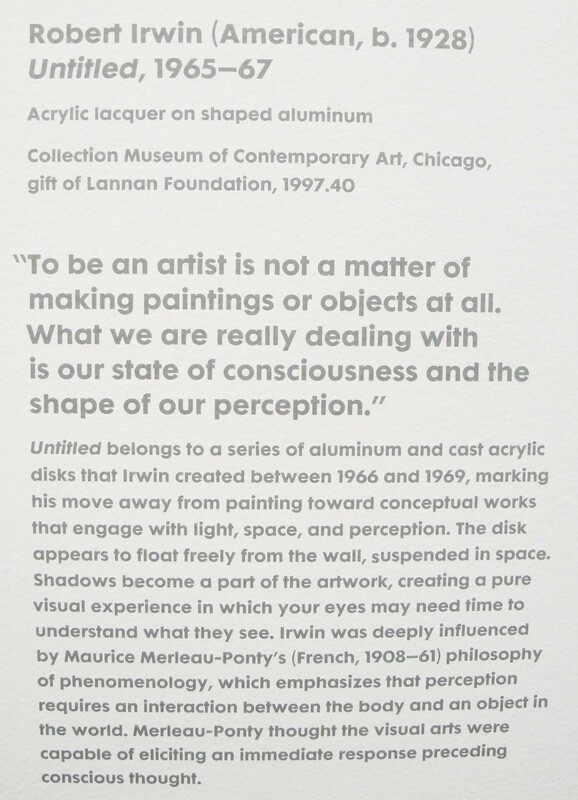 Because they are considered to be art and as such, by definition, have meaning. Oops, didn’t you say that they have no meaning and are not to have meaning projected into them? This impass becomes apparent when you read the wall texts next to these pieces. To compose these paragraphs the curators needed to generate some verbiage. “What are you looking at?” will just not do. 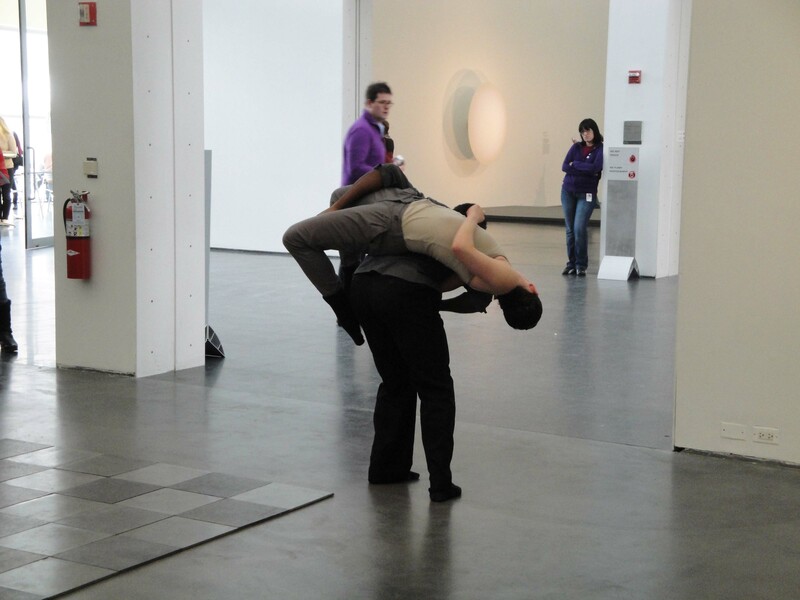 This is, after all, an art museum and we do have this notion that art has to do with meaning. 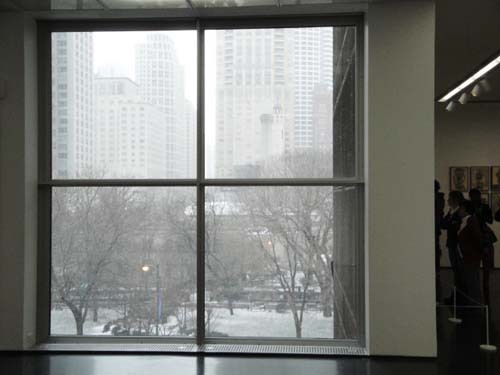 And so we get funny flirtations with the quest for meaning, for example, that some object on display offers “thrillingly beautiful and poetic moments of clarity.” Sorry, Mr. Curator, beauty and poetic moments are what minimalism was against, throwing all such attempts into the deception-and-illusion bin. I would advise you to read the texts on the walls with a sense of humor. You will learn nothing from them. But allow yourself to get irritated by them, the better to see the actual work, the way the chorus in a Greek tragedy acts as a niggling nuisance, the better to help you focus on the pratfalls of the protagonist. If you happen get to the MCA in time to catch a tour, be sure to ask the guide the obvious questions. Let’s not be sanctimonious about this. No wool over the eyes, please, we’re moderns. And, hey, we’re doing minimalism here. 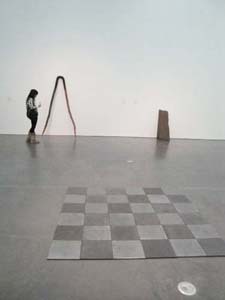 Make a point of walking on Carl Andre’s tiles, as you are encouraged to do, and see if you can “feel the different densities of metal through our feet.” Not in your mukluks ,wedgies and booties, you can’t. Where’s the bench where you take off your shoes so you can go barefoot and “feel the different densities” of the metal? Ask the guard, in a matter-of-fact—a minimalist—tone of voice. One wall text, titled “Building Blocks” does get to the heart of the matter. It states that the art work “encourages us to look more carefully and thoughtfully at the world around us.” Aye and arrrrgh, ye moderns, reality is all ye got and all ye need to know. So then I went to the coat check, did the scarf and mittens thing and stomped down the icy steps into a Chicago snow storm, paying attention to the impact of reality—what else is there!—and loving every neutrino passing through my bones.